Islas Marietas’ Playa Escondida (Hidden Beach) took 3rd place in Mexico on USA Today’s 10Best List; Sayulita obtained 8th place in Travel + Leisure’s Best Beaches in Mexico. Some of the world’s most beautiful beaches can be found in Mexico, where there are approximately 450 of them lining its expansive coastlines. 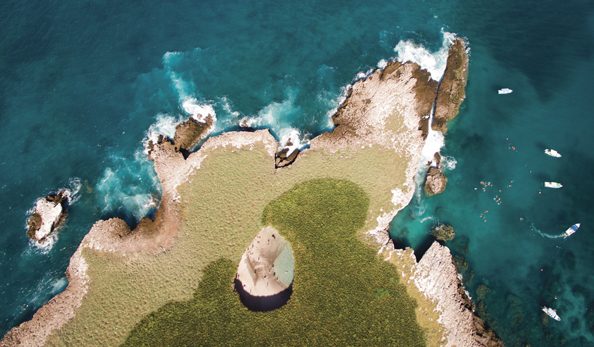 Among them: Playa Escondida (Hidden Beach) in the Islas Marietas and the beach at Sayulita, which were recognized as tops in the country in recent popularity lists compiled by USA Today and Travel + Leisure. “Both USA Today and Travel + Leisure are very prestigious media and together they represent over 30 million impressions within our Natural Market,” said Marc Murphy, Managing Director of the Riviera Nayarit Convention and Visitors Bureau. After a month of voting by the general public following an announcement made by USA Today for its 10Best list in the category of “Best Mexico Beach,” the iconic Islas Marietas’ Playa Escondida took 3rd place. Thanks to its astounding natural beauty, Playa Escondida has been among the triggers that have lead to an increase in tourism to the Riviera Nayarit. Meanwhile, Travel + Leisure journalist Stephanie Wu placed the beach at Sayulita in 8th place among the “best beaches in Mexico” thanks to its variety of shops and restaurants; the great fish tacos, its trendy vibe and the dozens of surfers that ply its waves.